3.8 out of 5 based on 42 bloggers and 19 commenters. 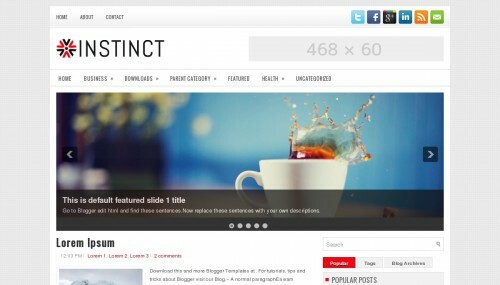 Instinc is a free blogger template adapted from WordPress with 2 columns, right sidebar, ads ready, footer columns, slider, social bookmarking icons, posts thumbnails, tabs, drop down menu and neutral colors. How to make logo for your blog?? This looks like a pretty good layout. I like how there is a horizontal menu bar on the top, which blogger currently doesn’t offer. I will think about changing it soon! I am using your template, it’s fantastic. I want to convert de ad of the top to a bigger one, but I can’t do so because the widget area is fixed. Do yo understand. I have looked at the html code and I can’t figure how to make bigger the widget area. This is definitely one of the nicest Blogger templates! Kudos to the creator. Would need help with the tweaking though. Is there a way to change the time under the post titles to dates? Would greatly appreciate help. Thanks. Impressive format. Good quality and colors. Perfect for my shoe blog. Como faço para trocar as imagens principais? Is it possible to customize this template? I tried but it didn’t work. But 1~4 widgets must be the same. I’m having some difficulty adjusting the size of the slider photos so they fill the entire screen. Also, in the headers, how do you link to the other pages? Any way to add the date to the post? Seems like it only displays the time it was published. Thanks! How do I get rid of that menu? Thank you for this great template. I have one question, how can I change that red colour of the menu bar when you hover the mouse on? I have been able to change all the colours other than that one only. I use your template for my Blogger webmarketing blog. It is very successful, congratulations and thank you for the free provision. I have a problem with the new Google+ comments function. In fact, when I enable the integration of Google+ nested comments, they do not appear on my blog. In addition, comments placed directly through Blogger no longer appear either! When I turn the comments feature Google+ displayed on a new page, they appear well however. It looks like a concern of css styles because from a mobile phone, it works quite correctly. Could you help me solve this problem please? hi! this is a beautiful template. but i come across a problem and could not settle it. when i click on my image, it should pop out to be viewed in original size and everything else is hidden black transparency, right. but then the menus are blocking my image and doesnt stay at the back. this should not happen right? how do i settle this problem. does anyone else come across this? The Google+ comments do not appear unfortunately. DO you mean i’ve to replace the xisting css or should I add it ?